Losses in popularity are common for those in the political spotlight. It starts after the end of the “honeymoon” period and can be an ever-present annoyance throughout a leader’s years in authority. Speaker John Boehner (R-Ohio 8th district) is dealing with a slide that has previously been experienced by staunch adversaries like Senate Majority Leader Harry Reid (D-Nevada) and Rep. Nancy Pelosi (D-CA 12th district), his predecessor as Speaker. Then, of course, there was the shocker in May when Eric Cantor (VA-7th district), the #2 Republican in the House and potential successor to Boehner, lost his primary election. And then, even more recently, Senator Thad Cochran (R-MS) had to win a runoff primary. 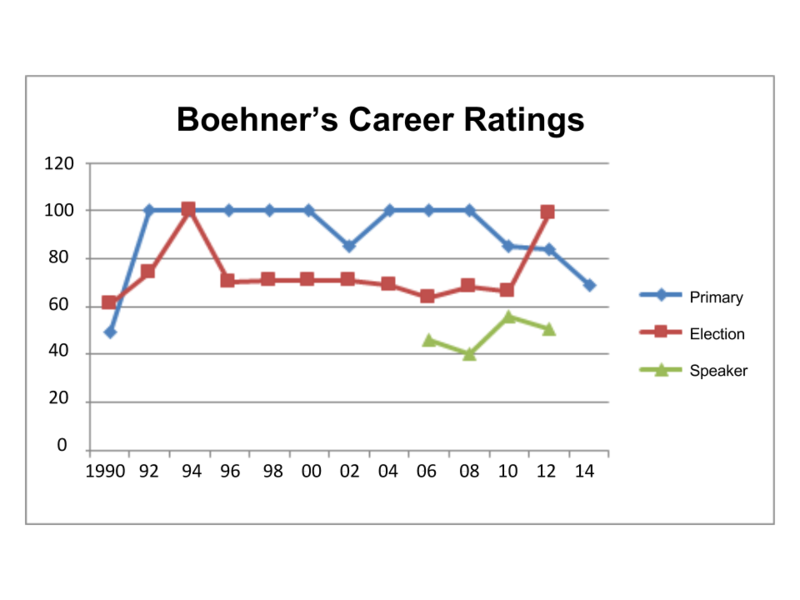 Speaker Boehner has been in Congress since he was first elected in 1990. The strong support from his constituents has allowed him to work his way up through the ranks to his current position. As a member of the “Gang of Seven,” they took advantage of the public’s mistrust of the Democrats after the House Bank and Congressional Post Office scandals to engineer a Republican majority in the House in 1994. Significant Republican losses four years later cost Gingrich his Speaker’s position, and Boehner’s conference chairmanship was lost through some mistakes on his part. Nevertheless, he worked his way back, and on Feb. 2, 2006 was voted Majority Leader in the House and eventually became Speaker. 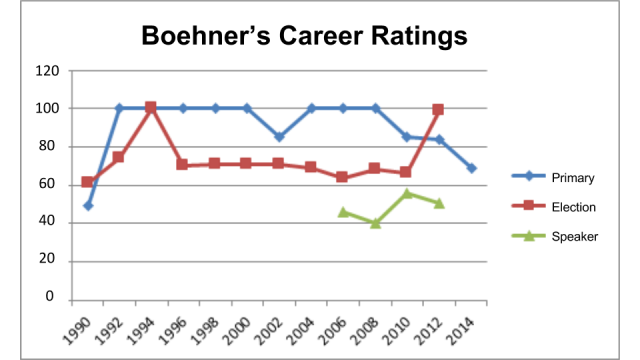 As mentioned in a previous pair of OCR articles, “Why the GOP Can’t Wait until 2016 to Act, Part 1 and Part 2,” Speaker Boehner’s position as captain is not as revered as Speaker “Tip” O’Neill’s was in the 1980s. To some, this has been because he compromises too frequently with the Administration or appears reluctant to put the hammer down on dissidents, as Mr. O’Neill was known to do. Thus spoke Mr. Boehner on 3/27/2014 regarding yet another arbitrary and non-constitutional delay in the enforcement on Obamacare. His tone indicated a necessary, more assertive position against the President. Assertive action is also required, and recently the Speaker announced his intention to sue the President over excessive use of executive orders. Ridiculed by the Left because Obama has issued fewer executive orders than some of his predecessors, Boehner understands that it’s not just their number, but their impact on the citizenry, that matters. Obama’s use of his famed pen has gone beyond his branch’s authority on many occasions, and a lawsuit is the most likely way to stop on-going abuse of power. 2) IMMIGRATION. This needs capital letters. We can and we must take a multi-task approach (borders and legalization with appropriate penalties) or the Republicans will lose the Hispanic vote, which never should have gone to Obama in either election. 3) Common Core (aka “Obamacore”) is more nefarious than simply inviting the federal government to influence and eventually control education. Its “standards” to make student “college-ready” are, in reality, to make them “worker-ready” by diluting the broad and deep subject background required of an informed citizenry, something Obama and disciples are wary of. Indiana recently changed its mind and turned away from it. Exactly what the House can do about this at this time is questionable, but the public needs to be assured that the Speaker and the House are supportive of their attempts to extricate themselves from this sticky web which came with, of course, a financial incentive. In conclusion, it’s a great time to revive “speak softly and carry a big stick.” Then again, with all of the noise on Capitol Hill and in social media, Speaker Boehner might have to speak LOUD, too. 5 – “Four years later, when 44 Democrats joined in voting to overturn a ruling of the chair, the kind of parliamentary decision that is the lifeblood of the House, Mr. O’Neill wrote them that he was ‘extremely disappointed’ and obliquely warned that ‘disciplinary measures’ were under consideration.